A boy in restraints. Photo by Eric Rosenthal, DRI, January 2015. 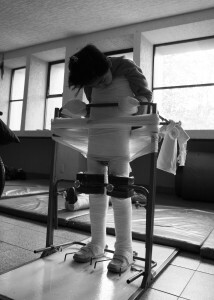 Mexico City – July 22, 2015 – Today, Disability Rights International (DRI) released a report No Justice: Torture, Trafficking, and Segregation in Mexico. The report reveals the existence of a “blacklist” of institutions for children and adults with disabilities known to be abusive by Mexico City authorities – who nevertheless allow these facilities to continue operating without interference. “Mexico City authorities knowingly let perpetrators subject children and adults with disabilities to atrocious, life-threatening abuses. Without any safe, community supports available in Mexico City, however, survivors of abuse will remain in segregation in other institutions. There will be no justice in Mexico without significant reform,” stated Eric Rosenthal, DRI’s Executive Director. The report focuses especially on the survivors of a blacklisted facility, Casa Esperanza, the site of torture, physical, and sexual abuse of individuals detained there against their will. Women reported being subject to sexual and physical abuse on a daily basis, and some were victims of trafficking. Women and girls were routinely sterilized. People were kept in cages, long-term restraints, and lived in degrading, unhygienic conditions without adequate medical care. DRI reported these abuses to Mexican authorities in June 2014 but, for over a year, authorities failed to take action. In recent weeks, Mexican authorities have responded to pressure from DRI, the Mexico City Human Rights Commission, and the U.N., and shut down the institution. “There is no safe place for the survivors of Esperanza to go. Every day that Mexico denies the right of persons with disabilities to live in the community marks another day in which Mexico is out of step with our international human rights obligations” said Humberto Guerrero of DRI. “We demand justice for the survivors of Casa Esperanza and all women with disabilities who have been forcibly sterilized, raped, and trafficked. We call on Mexico City authorities to ensure that vulnerable individuals can live freely and with dignity in the community, rather than imprisoned in other institutions,” said Priscila Rodriguez, of DRI. “It’s time for change in Mexico, and we will not stand by and watch another generation suffer torture and abuse in these horrific institutions,” she concluded. No Justice: Torture, Trafficking and Segregation in Mexico is available in English and Spanish on DRI’s website.